private guided tour of the temple - exclusive to our tour of Bath! 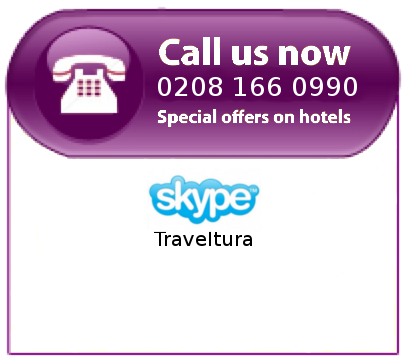 Stonehenge is one of the most famous pre-historic structures, now a World Heritage Site. Stonehenge lies on the great Salisbury Plains, just waiting to be explored. 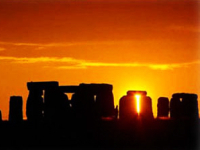 More than 5000 years old, it is believed that this ancient site has been home to the spiritual worship of druids and celts. However, no one knows for sure what the huge stones were intended for; some think it was a temple, some believe it was a cemetary, and still others think it was a pre-historic observatory. We still haven't discovered how the huge stones were transported! With our guide, you will have the opportunity to visit the inner circle of this astonishing monument, and unlock the mystery for yourself. After the visit to Stonehenge, we leave for a picturesque village pub for lunch*, before we go onto Bath. Bath is a beautiful Georgian city, as well as a World Heritage Site, with beautiful crescents, architecture and of course the famous Roman Baths. 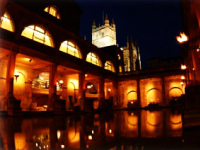 After our guided tour, you will have time to visit Bath Abbey and Pulteney Bridge that faces the river Acon. You can chose to explore Bath, shop, or perhaps take afternoon tea. As night draws, the Roman Baths come alive; flares and torches surround	the springs and swirling mist dances on the surface of the water. As others leave, we offer guests a private, torch-lit tour of the temple! Wander off and explore the misty passageways at your leisure...a truly magical end to an adventurous day! * Lunch not included in package.